Mike Adams At His Honest Weight announces his fourth album, There Is No Feeling Better. This new one, from our favorite Bloomington, Indiana native, is the kind of record you can make only after really knowing how to make records. It’s ambitious, but never labored sounding, sweeping but always intimate. All the qualities that have made the Adams songbook such a joyful collection to engage with—the witticism of 2011’s Oscillate Wisely, the playful experimentalism of 2014’s Best of Boiler Room Classics, the gigantic melodies of 2016’s Casino Drone—are on display here yet again, but they feel heightened, deeper, funnier, sweeter, and more resonant. “Best I can tell, Pressing Mesh is about fighting to remain hopeful in the face of seemingly endless bad news and confusion. My pea brain is easily overwhelmed by details and ambiguity. I’m singing here about trying to find my Moral Denominator, so I can cut through the mess and build my thoughts on a positive, trustworthy, foundation.” says Mike Adams. 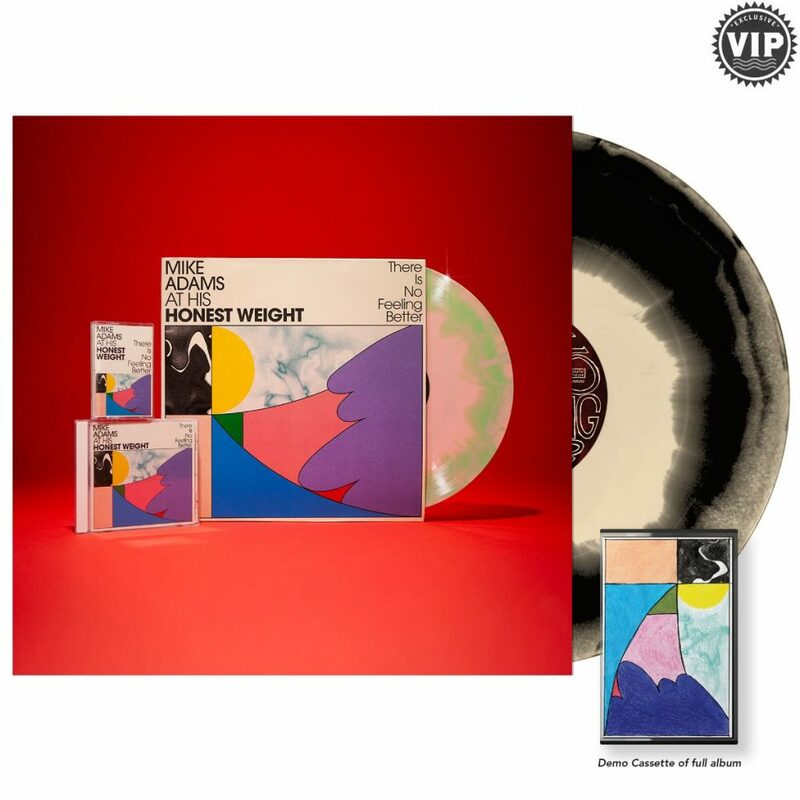 VIP Limited Edition Vinyl + Digital: $ 20.00Limited to 300 pressed to bone & black a-side/b-side colored vinyl. VIP bundle includes bonus cassette with demo versions of the album. Includes a 14 page booklet with lyrics and chord charts. Instant download of first single “Pressing Mesh” with full album in high quality MP3 + WAV sent before 06/14. Black Vinyl + Digital: $ 15.00Insert includes a 14 page booklet with lyrics and chord charts. Includes instant download of first single “Pressing Mesh” with full album in high quality MP3 + WAV sent before 06/14. CD + Digital: $ 10.00Insert includes a 14 page booklet with lyrics and chord charts. Includes instant download of first single “Pressing Mesh” with full album in high quality MP3 + WAV sent before 06/14. Digital: $ 8.00Includes a 14 page booklet with lyrics and chord charts [PDF download sent with full album]. Instant download of first single “Pressing Mesh” with full album in high quality MP3 + WAV sent before 06/14.